Inflation, the rapid expansion of the universe in the first moments after the big bang, triggered sound waves that alternately compressed and rarefied regions of the primordial plasma. After the universe had cooled enough to allow the formation of neutral atoms, the pattern of density variations caused by the sound waves was frozen into the cosmic microwave background (CMB) radiation. By studying the acoustic signals in the CMB, cosmologists have estimated the age, composition and geometry of the universe. But the results suggest that the biggest component of the modern cosmos is a mysterious entity called dark energy. When distances in the universe grew to one thousandth of their current size — about 380,000 years after the big bang — the temperature of the gas decreased enough for the protons to capture the electrons and become atoms. This transition, called recombination, changed the situation dramatically. The photons were no longer scattered by collisions with charged particles, so for the first time they traveled largely unimpeded through space. Photons released from hotter, denser areas were more energetic than photons emitted from rarefied regions, so the pattern of hot and cold spots induced by the sound waves was frozen into the CMB. At the same time, matter was freed of the radiation pressure that had resisted the contraction of dense clumps. Under the attractive influence of gravity, the denser areas coalesced into stars and galaxies. In fact, the one-in-100,000 variations observed in the CMB are of exactly the right amplitude to form the large-scale structures we see today. Yet what was the prime mover, the source of the initial disturbances that triggered the sound waves? The question is troubling. 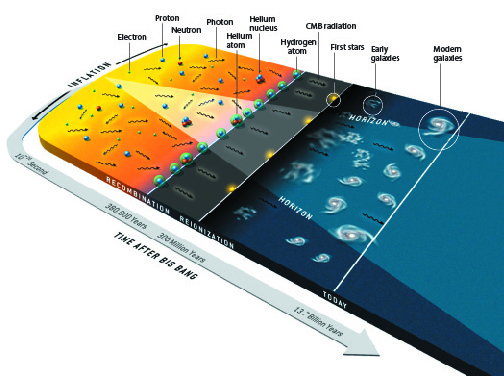 Imagine yourself as an observer witnessing the big bang and the subsequent expansion. At any given point you will see only a finite region of the universe that encompasses the distance light has traveled since the big bang. Cosmologists call the edge of this region the horizon, the place beyond which you cannot see. This region continuously grows until it reaches the radius of the observable universe today. Because information cannot be conveyed faster than light, the horizon defines the sphere of influence of any physical mechanism. As we go backward in time to search for the origin of structures of a particular physical size, the horizon eventually becomes smaller than the structure. Therefore, no physical process that obeys causality can explain the structure's origin. In cosmology, this dilemma is known as the horizon problem. Fortunately, the theory of inflation solves the horizon problem and also provides a physical mechanism for triggering the primordial sound waves and the seeds of all structure in the universe. The theory posits a new form of energy, carried by a field dubbed the inflation which caused an accelerated expansion of the universe in the very first moments after the big bang. As a result, the observable universe we see today is only a small fraction of the observable universe before inflation. Furthermore, quantum fluctuations in the inflaton field, magnified by the rapid expansion, provide initial disturbances that are approximately equal on all scales — that is, the disturbances to small regions have the same magnitude as those affecting large regions. These disturbances become fluctuations in the energy density from place to place in the primordial plasma. Evidence supporting the theory of inflation has now been found in the detailed pattern of sound waves in the CMB. Because inflation produced the density disturbances all at once in essentially the first moment of creation, the phases of all the sound waves were synchronized. The result was a sound spectrum with overtones much like a musical instrument's. Consider blowing into a pipe that is open at both ends. The fundamental frequency of the sound corresponds to a wave (also called a mode of vibration) with maximum air displacement at either end and minimum displacement in the middle. 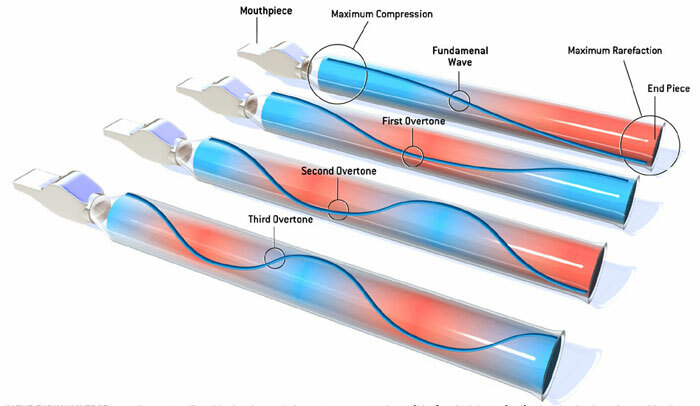 The wavelength of the fundamental mode is twice the length of the pipe. But the sound also has a series of overtones corresponding to wavelengths that are integer fractions of the fundamental wavelength: one half, one third, one fourth and so on. To put it another way, the frequencies of the overtones are two, three, four or more times as high as the fundamental frequency. Overtones are what distinguish a Stradivarius from an ordinary violin; they add richness to the sound. The sound waves in the early universe are similar, except now we must imagine the waves oscillating in time instead of space In this analogy, the length of the pipe represents the finite duration when sound waves traveled through the primordial plasma; the waves start at inflation and end at recombination about 380,000 years later. Assume that a certain region of space has a maximum positive displacement — that is, maximum temperature — at inflation. As the sound waves propagate, the density of the region will begin to oscillate, first heading toward average temperature (maximum negative displacement). The wave that causes the region to reach maximum negative displacement exactly at recombination is the fundamental wave of the early universe. The overtones have wavelengths that are integer fractions of the fundamental wavelength. Oscillating two, three or more times as quickly as the fundamental wave, these overtones cause smaller regions of space to reach maximum displacement, either positive or negative, at recombination. Cosmic Harmonics: Sound waves also oscillated in the plasma of the early universe. 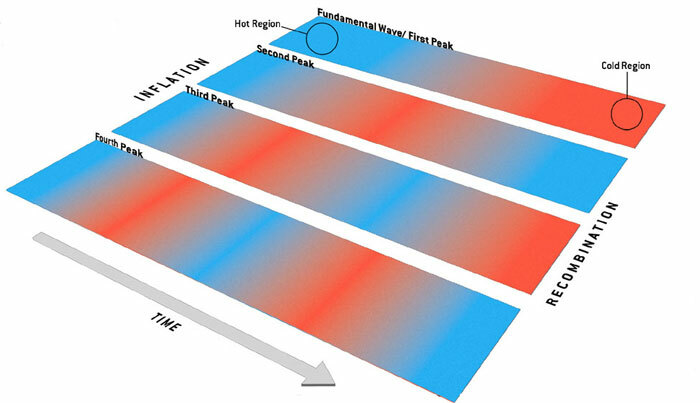 After inflation, the fundamental wave compressed some regions of plasma and rarefied others, causing the temperature of the CMB radiation in the regions to reach maximum (blue) and minimum (red) values by the time of recombination. The overtones oscillated two, three or more times as quickly, causing smaller regions to reach maximum and minimum CMB temperatures at the time of recombination.